Lets face it! Diesel automatic transmissions can be troublesome, particularly those models that use vacuum to control shifts. This is largely due to the fact that diesel engines don't produce vacuum naturally. It has to be artificially manufactured. This is what makes diesel transmission tuning difficult. The numerous vacuum and pressure controls that were added to make it shift properly can create all kinds of problems when they fail or get out of adjustment.The big challenge in writing the manual was to clearly explain how to get all these controls working in harmony for the transmission to operate at peak efficiency. Can this manual really save you big $$$ - watch this video! Many problems related to poor or improper shifting can be solved without repairing or replacing the transmission. Can you imagine how many Mercedes diesel transmissions have been replaced over the years that most likely did not need replacing! From my own experience I know the numbers would be shocking. I will never forget one particular customer bringing me his 300D for a second opinion on an abrupt shifting problem. He had been told his transmission needed a complete overhaul and it would cost $1800. Upon close inspection I found the rubber hose connector at the vacuum modulator had failed. After replacing the hose the transmission performed as new. Total cost of repair including labor = $22.00. Stories like this are what motivated me to complete this manual. The manual is broken down into phases (rather than chapters). These phases have to be followed in order to achieve success. Note that the first phase starts with the engine. That's right! If your engine is not tuned properly or developing full power, forget about trying to tune the jerks and flairs out of shifts! Next comes the vacuum system. Why is that so important? Since 1978 vacuum became the key shift control in diesel automatics. That whole system has to be dealt with next. From there the manual progresses through the phases of repairing key vacuum controls, adjusting mechanical controls, dealing with internal hydraulics, testing and adjusting the mysterious VCV, and finally tuning them all together for the final performance. If you are a diesel owner or diesel enthusiast you won't want to put this manual down once you start reading! Even if you don't plan on doing the work yourself, the information in this manual could save you big $$ by preventing an unnecessary transmission overhaul or replacement. This manual does not cover removing the transmission, opening the transmission, or repairing transmission internals. We have other manuals/kits that only cover the following. We do NOT have any manuals that deal with opening up or overhauling an automatic transmission. Application: 61x refers to the diesel engine. These include the 615 and 616 four cylinder diesels and the 617 five cylinder diesel automatic transmissions from 1969 to 1985 with the exception of the 201 chassis 190D. Some troubleshooting and adjustment is specific to the older non-vacuum regulated transmissions. But due to the complexity of vacuum controls, most of the material in the manual relates to transmissions with vacuum modulators installed. 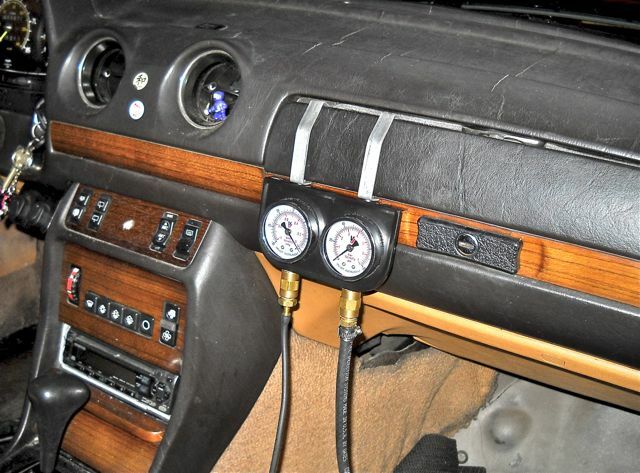 Vacuum controls first appeared on the 1978 300SD and then in 1980 on the 240D, 300D, 300CD and 300TD. NOTE: Proper testing and tuning will require vacuum and hydraulic gauges along with the proper connection hose and fittings. Kent has put together two new test kits (LISTED BELOW) that will allow you to properly tune the transmission yourself. These kits are available separately and can be purchased along with or even after reading the manual. This unique kit will allow you to hook up a 30 in HG vacuum gauge between your vacuum control shifting valve (VCV) and your transmission modulator to test the VCV for proper function and to tune it for peak shifting performance. Without knowing what the critical vacuum shift supply is doing from idle to full throttle travel, it is nearly impossible to properly tune your transmission. Like many owners, maybe you have tried to adjust the vacuum and the modulating pressure by feel - the problem with that approach is you never really know the true affect your adjustments are having. Applicable to 114 115 116 123 and 126 Chassis, years and models listed above. Troubleshooting an annoying shift problem must first start with the vacuum modulator. This vacuum control unit mounted on the side of the transmission must be tested and adjusted to specs BEFORE you move on to other adjustments. Unfortunately this can not be done by guess or by feel. There is a pressure port on the side of the transmission that you must tap into and connect to a pressure gauge. The engine must then be started and the modulator adjusted to a set pressure for that specific transmission. It is not a difficult job with the proper test tools and information, and can be done in less than an hour. Too much pressure and abrupt shifts will occur. no time, thanks again for the great job! sincerely your friend George R.
This unique kit will allow you to hook up a 30 in HG vacuum gauge between your vacuum control shifting valve (VCV) and your transmission modulator to test the VCV for proper function and to tune it for peak shifting performance. Applicable to 114 115 116 123 and 126 Chassis, years and models listed above. Troubleshooting an annoying shift problem must first start with the vacuum modulator.